Back in June during SAPPHIRE NOW I shared with you how SAP Cloud Platform powers SAP‘s vision of an Intelligent Enterprise . With today’s blog post I want to follow-up and build upon that and provide further insights and more technical depth. Yet, before we do so, let’s quickly recap on the main idea behind “Intelligent Enterprise” and its main pillars. Over the past years SAP’s portfolio has been steadily growing into a modular suite around SAP S/4HANA, the digital core, and complemented by a comprehensive set of best-of-breed LOB cloud applications (Intelligent Suite). At the same time, emerging technologies such as machine learning, predictive & real-time analytics, Blockchain and IoT (Intelligent Technologies) have redefined the art of the possible and customers expectations alike. Fast growing data sets need to be transformed from Big Data into Smart Data to ultimately allow businesses to make the right decision at the right time. Hybrid IT landscapes spanning from on-premise to cloud and being connected to larger business networks have become the new normal. 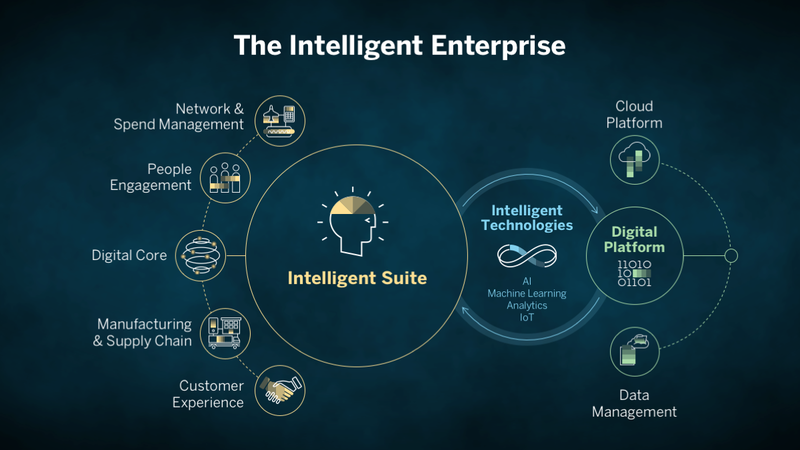 The Intelligent Enterprise vision is SAP’s answer to support customers and partners in this new era of intelligent computing and the technical foundation and enabler of digital transformation is the Digital Platform: SAP Cloud Platform and the SAP HANA Data Management Suite. “SAP Cloud Platform is in the center. Ultimately, it caters to helping businesses to achieve greater business agility by streamlining and optimising the development of new cloud applications (build) and allowing them to subscribe to cloud solutions provided by SAP and its entire partner ecosystem (buy). With that said, let’s have a closer look at all these aspects by going through them individually following a bottom-up approach. To abstract from the underlying infrastructure SAP Cloud Platform sits on top of a multi-cloud layer that offers free choice of IaaS provider. As such, customer and partners can pick their preferred choice, be it SAP or any of the big hyper-scale cloud providers. This approach allows you to pick the best-suited infrastructure provider(s) and datacenter(s) according to your needs, addressing aspects such as legal requirements & compliance considerations as well as enabling strategic co-location scenarios. Just recently, Alibaba Cloud and SAP announced a strategic partnership to bring SAP S/4HANA and SAP Cloud Platform to China . NOTE: Going forward, SAP Cloud Platform will also be made available as a private cloud edition. The first pilot projects are already underway and conducted in a joint partnership with IBM and Atos. 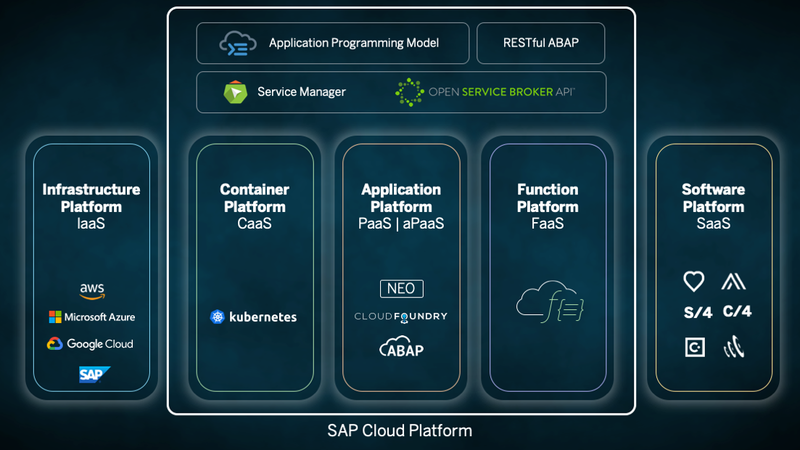 For the development of business applications and/or microservices the PaaS environments (Neo/CloudFoundry and ABAP) are the recommended option. If you need more direct infrastructure access or just want to port existing, containerised applications to SAP Cloud Platform, then Kubernetes may be a good fit. At the other side of the spectrum, if you just want to define atomic, stateless functions that are executed on demand (via HTTP) or triggered by events in a serverless fashion then Functions may be the easiest and most cost efficient option. Most importantly though, please note that all of these environments can be used in conjunction as needed: the SAP Cloud Platform Service Manager allows to lookup and bind service instances regardless of their hosting environment. For example, while backing services that require large GPU or Hadoop clusters (e.g. for machine learning or Big Data scenarios) may be managed and operated via Kubernetes, they can be consumed by applications running on Cloud Foundry. This combination of multi-cloud infrastructure abstraction and cloud-native technologies comprise the multi-cloud foundation of SAP Cloud Platform that powers all services, capabilities and applications running on top (run-on) and those leveraging said services (run-with). In context of the modular suite and hybrid IT landscapes Integration will remain a key topic, because only “an integrated enterprise can become an intelligent enterprise”. With the increasing adoption of cloud-based LoB and industry solutions, and with the resulting shift to hybrid deployment models, it is vital for SAP and our customers that end-to-end solutions are developed and delivered. This convergence of cloud and on-premise products into hybrid solution landscapes imposes several additional challenges with respect to integration. For more details please read the respective blog post  from my colleague Harsh Jegadeesan. SAP Cloud Platform Integration services addresses these needs and as the default integration solution for cloud-to-cloud and cloud-to-on-premise by offering out-of-the-box integration content and technologies for SAP solutions and SAP-to-third party scenarios. 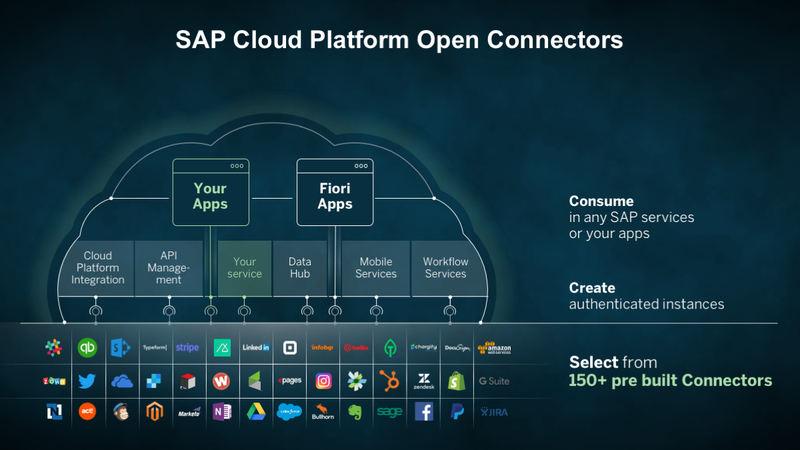 Two new exciting additions to this line-up are SAP Cloud Platform Open Connectors [7| and SAP Cloud Integration Automation Service . 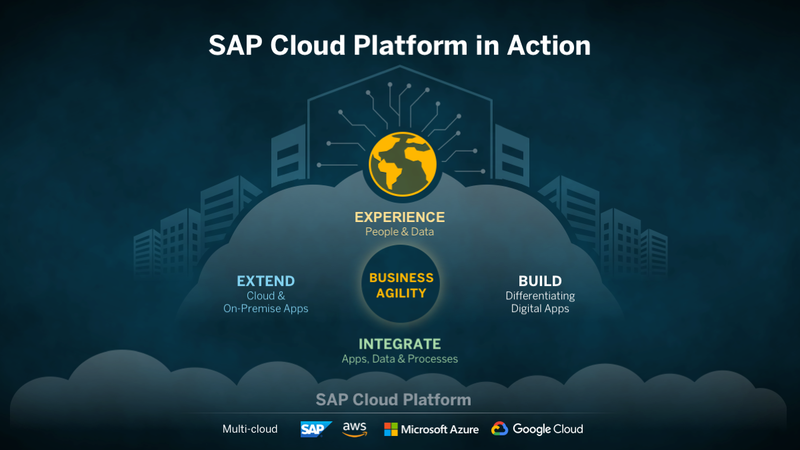 As already mention, SAP Cloud Platform is also the designated extension platform supporting customers to extend any SAP application in a side-by-side fashion, whether it’s on premise or in the cloud. This way customers can avoid all the negative, long-tail consequences of over-customized systems, that may have kept them from keeping up with the speed of innovation delivered by SAP in the past. 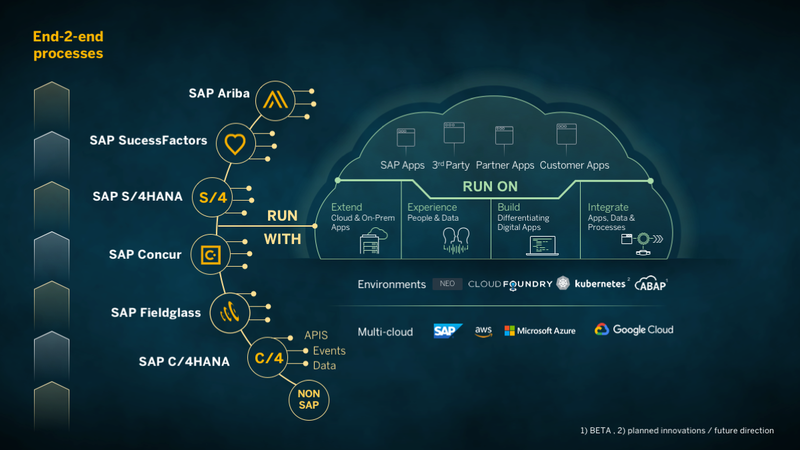 In addition to the aforementioned ABAP environment and the upcoming SAP Cloud Platform Functions capabilities, there are multiple other services and solutions that address SAP S/4HANA and Cloud LoB side-by-side extensions and custom code transformation to the cloud, such as the recently updated SAP S/4HANA Cloud SDK . One of the most exciting news on that front is the SAP Cloud Platform Extension Factory, which is currently being developed in a close collaboration model between SAP Cloud Platform and the LOB solutions such as Hybris. We are happy to provide a “lab preview” here at TechEd – please read the respective blog post  from my colleague Rui Nogueira. One of the main talking points in Bernd Leukert’s opening keynote at SAP TechEd 2018 in Las Vegas was “openness” and why only an open platform & open ecosystem play can result in a positive-sum game for all. This mindset has always been a main guiding principle for SAP Cloud Platform from day one . Consequently, SAP Cloud Platform leverages the de-facto open-source standards such as Cloud Foundry and Kubernetes as runtime environments (see above). This ensures a low entry barrier and reduced total cost of development as developers do not have to learn about proprietary technologies and can tap into the collective mind of the open-source community at large. As such, SAP Cloud Platform supports popular open-source frameworks such as the Spring framework and others. At the same time though, a lot of developers within the ecosystem have raised their interest to receive even further guidance from SAP about how-to efficiently develop smart cloud applications: enter Application Programming Model for SAP Cloud Platform. In a nutshell, it’s an opinionated approach to develop cloud applications using common technologies from SAP such as Core Data Services for interacting with data and SAPUI5 and SAP Fiori at the presentation layer with a RESTful programming model for business logic . It’s an open architecture that allows to exchange certain technologies with alternatives as needed, e.g. by using Angular or React on the UX layer or to leverage Spring in the business logic tier. It comes with full support by SAP Web IDE, the recommended browser-based development environment and offers plugins for popular development tools such as Eclipse and Visual Studio Code going forward. If you want to check it out – this blog post by my colleague Cecilia Huergo helps you to get started . Last, but not least… SAP Cloud Platform also caters to tech savvy people without an engineering background (aka citizen developers) by offering model-driven development tools such as the SAP Cloud Platform Rapid Application Development by Mendix. Ohad Navon summarized the latest updates for you in his blog post . Last, but not least – let’s talk about the experience pillar. As customers progress through their digital transformation and embrace and leverage intelligent technologies, the way how end-users interact with systems and the interaction between human and technology in general, is going to fundamentally change. There will be an increased demand for self-service and user-centric interfaces that allow users to seamlessly interact with diverse application and backend technologies – via mobile interfaces, via web interfaces or via speech. Processes will trigger human interaction, systems will push alerts in case of unusual events and applications will make recommendations on how to best act on certain situations. SAP Fiori has been at the forefront of this change from complex, transactional interactions performed by back-office experts towards more lightweight, engaging user experiences happening on the go/ on demand via various channels from traditional desktop applications, to mobile to conversational and contextual UIs (e.g. Co-Pilot and chat bots). The SAP Cloud Platform SDK for Android is GA! Of course, I can only scratch the surface in this blog post and hence I would like to wrap it up by recommending to you to closely watch the SAP Cloud Platform blog roll to stay up to date. Yes, given the time of publication (TechEd) the major focus of this blog post has been on more technical topics catering to the developer ecosystems and technologists. However, given that many of the topics covered are included in the consumption based pricing model, let me add a link to the blog post by my colleagues Holger Neuert summarising the latest updates from a commercial perspective . Awesome, thanks Mat for this great summary and explanation! Many thanks for the feedback Sven! Interesting to hear about the role of the Service Manager. Is there a link where I can find more info on this service? Most importantly though, please note that all of these environments can be used in conjunction as needed: the SAP Cloud Platform Service Manager allows to lookup and bind service instances regardless of their hosting environment.